Checking a car’s oil regularly is important step towards maintain a car’s engine. However, for many, heading under the hood can be a bit nerve racking. With so many covers, reservoirs and do-hickeys, those with a less-than-mechanical ability tend to quickly shut the hood and head to the local oil change place. Here’s a quick guide to checking the oil that breaks down when it’s time to get it changed. Car engines have what’s called an oil dipstick. Oil dipsticks are long rods that reach down into the bottom of the oil pan where oil is stored. The top of this stick is located in the front of the engine and has a brightly colored loop that can be used to pull it out. Once out, the other end will have a set of holes or some other system of markings that represent the minimum and maximum oil levels for the engine. If you can’t find the dipstick for your specific vehicle, check the owner’s manual for its location as some vehicles have it located in other spots. When working with an engine, like any machine, it’s important to be aware of some safety measures and work in the right environment to avoid damaging it or injuring yourself. First, make sure that your engine is off and that the radiator fan or other externally moving components are not running. Also, the oil inside a running engine can reach temperatures of 200+ degrees so give the engine an hour to cool down before checking your oil. Finally, since you’re checking the oil level in the bottom of the engine, be sure to park your vehicle on a flat level surface where the oil level will be consistent throughout. Often times, the last oil change place you took your vehicle to placed a sticker in the upper left corner of your windshield. This sticker indicates the date and mileage you will be due for your next oil change. While different oil manufacturers and shops will vary in their opinion on how often to change the oil, the sticker on the windshield will most likely range between 3000-5000 miles or 3-5 months. If you’re ever unsure about your oil level or when to have it changed, you can always refer to the sticker for a quick reference. 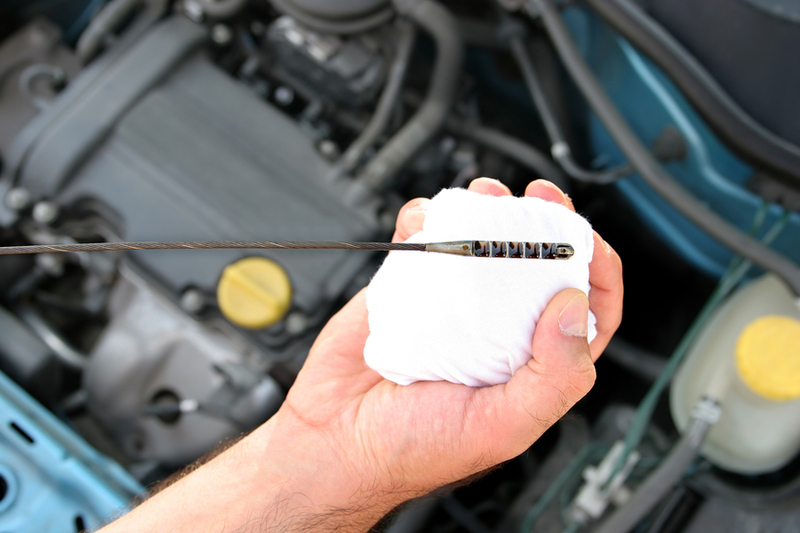 Now that you’re ready to check your oil, have a shop towel ready before pulling the dipstick out to check the oil. Pull the stick out and wipe it clean before reinserting it. This will help ensure an accurate reading. The stick needs to be wiped off to remove excess oil that may have splashed up on the stick while the engine was running. Remove the dipstick again and observe the oil level in comparison to the markings on it. Be sure that the level is correct and also that the oil is clean. Clean oil will have a golden brown color while oil that needs to be replaced will be dark or have debris in it. When you observe the oil you may notice that the color and cleanliness look good but the level is a little low. If this is the case, add some oil but be sure to use the same viscosity that was already in the engine. Not sure which oil to use? It may be better to be safe than sorry. Call the oil change place that last did the oil change and ask them what they put in. If the motor oil is dirty or very low, it may be time for a trip to Mr. Clean Car Wash for an oil change. Also, if you’ve gone past the amount of time allotted on your car’s oil change sticker, it may be time for a change.